We’ve extensively covered California’s drought, in which farming is playing a key role. While there’s no easy answer about how to restrict agricultural water use, a new startup wants to help farmers all over the country conserve valuable H20 using smart sensors that dictate where—and when—to water their crops. Here’s the problem with the way watering works right now: The ground isn’t perfectly flat, but most irrigation systems just spray surrounding crops evenly. As a result, some crops go under-watered or over-watered. Not only does this waste water, but it kills crops. The startup, CropX, is using swarms of sensors to help farmers water smarter. 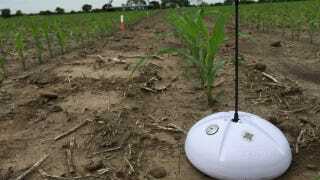 First, the farmer sticks three wireless, cloud-based sensors in the ground. From there, the sensors analyze soil conditions and suggests an amount of water those crops need. (TechCrunch says the sensors pull from publicly available data of the various soil types that can be found on a field.) Using a mobile app, the farmer views the readings, and the irrigation system is automatically adjusted to distribute just the right amount of water in that particular region of the field. The company says this method saves up to 25% of the water and energy that’s normally used in big field irrigation. TechCrunch also reports that CropX founder Issac Bentwich refers to the scheme as the “Internet of Soil.” That’s a borrowed buzzword that we’re weirdly okay with, in this case. Apparently investors are, too—CropX just announced $9 million in funding today. Now we’ll have to wait and see how the fields fare over the coming growing season.